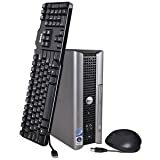 Dell Optiplex 755, Pentium dual Core2 2.0 GHz CPU, 2GB DDR2 RAM (expandable up to 8gb), 160 Gb SATA HDD, DVD +/-RW, 1.44 Floppy Drive, 8 USB ports, Avast Antivirus 2013, Ccleaner,Deep Burner, Google Chrome, Firefox, Skype, Opera, Adobe Reader, Adobe Flash,VLC Player,Trillian, Spybot Malware Protection, Windows 7 Home Pre installed! 1 GB RAM, integrated Graphic Cards, 80GB Hard Disk, DVD +/- RW, 1.44 Floppy Drive, 8 x USB port. Excellent and reliable PC, for home or Office use. Comes with a 30 days Peace of mind Warranty RTB. We are new on Amazon, however we have over a decade of experience in our bags. We have worked with bigegr names like IBm and know what we are doing! All our products are below market and Amazon prices at present, that’s just to gain happy customers and positive feed backs. Once you have purchased the item and if your happy with our service, do not forget to give us a feed back!